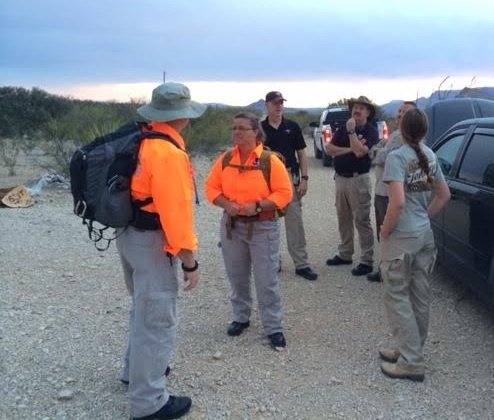 The TEXSAR team was once again called out to Big Bend country in mid-June. This time we were asked to support an on-going investigation by the Brewster County Sheriff’s office and the Social Security Administration. This deployment demonstrated TEXSAR’s agility by deploying personnel from numerous locations across Texas. Personnel in the search came from Midland, San Antonio, Austin, and Hearn meeting up in the west Texas town of Terlingua. The advance team arrived mid-afternoon which allowed them to link up with local Law Enforcement and actually do a recon of the search areas and arrange for link up the next morning. The remainder of the team arrived throughout the rest of the day and well into the night. Despite some extremely difficult conditions which were potentially hazardous to the health both the personnel and of the dogs, the team acted professionally and performed their tasks in an exceptional manner receiving praise from local Law Enforcement. The town of Terlingua was especially supportive going out of their way to make the team feel welcome. Team Terlingua demonstrated their community support by embracing a high school student who is interested in becoming a dog handler. Katie, came and observed the search in the morning, asking many probing and insightful questions. The K9 team welcomed this interest and let her work with a dog during a non-search related event. After the afternoon portion of the search was called off by the Sheriff, Katie joined the team during some additional dog training at the historic cemetery. At the end of the day, Katie was awarded a K9 pin and an Honorary TEXSAR Member certificate. Another outstanding job by the terrific members of the TEXSAR Team.